Trading on the New York Stock Exchange floor was halted for nearly four hours. The stoppage shortly after 11:30 a.m. local time Wednesday, with all screens displaying a “No quotation” message, according to eyewitnesses. Trading resumed around 3:10 p.m.
"We're currently experiencing a technical issue that we're working to resolve as quickly as possible. We will be providing further updates as soon as we can, and are doing our utmost to produce a swift resolution, communicate thoroughly and transparently, and ensure a timely and orderly market re-open," the NYSE said in an official statement. "It's chaos. No one seems to know the root of the cause which seems to me is making everything worse," a source on the floor of the stock exchange said, according to Bloomberg reporter Leslie Picker. The NYSE is reportedly rushing to fix the "technical problem," but there has been no official explanation why all floor trading has been halted. The exchange said it was canceling all open orders as well. "We've had some technical malfunctions. Some may be related to connectivity with other exchanges. I believe we're going to have a temporary pause certainly in a variety of stocks perhaps floor wide," Art Cashin, director of floor operations at the NYSE, told CNBC. The NYSE suspended all trading at 11:32 a.m., half an hour after initial reports of a technical problem, according to Yahoo Finance. Almost an hour into the shutdown, NYSE tweeted that the problem an "internal technical issue" and not a cyber breach. "We chose to suspend trading on NYSE to avoid problems arising from our technical issue," the exchange said in a series of tweets. "NYSE-listed securities continue to trade unaffected on other market centers." There was another technical glitch at NYSE earlier this morning, but it was supposedly fixed before the floor opened for trading at 9:30 a.m., Marketwatch reported. This morning's problem was a "gateway connectivity issue," according to Joe Saluzzi, co-founder of Themis Trading. After the suspension, traders were told that the problem was related to updated software that was rolled out before markets opened on Wednesday, one trader told the New York Times, on condition of anonymity. The stock exchange cannot reopen until all open trades were nullified... manually. "At the NYSE this is a manual process," Sal Arnuk, a principal at Themis Trading, told Yahoo Finance. "Is the NYSE technologically the most [robust] exchange in the world? No. The fact of the matter is the different exchange operators have diverse standards, different architecture. Some of them are more legacy than others. This is to be expected from time to time." 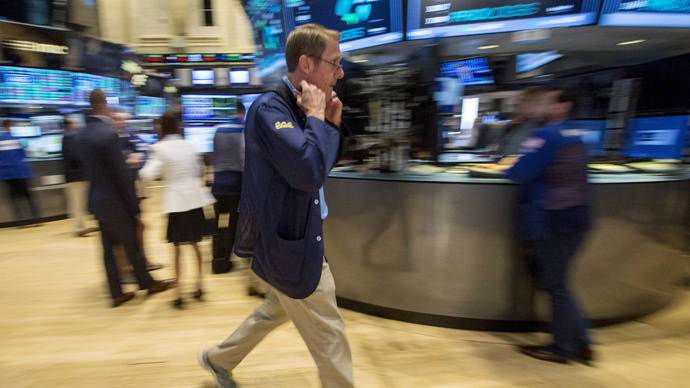 NYSE stocks are still being traded through other venues, Reuters reported. NASDAQ announced its systems were operating normally and trading NYSE securities. Other exchanges, such as NYSE Arca and NYSE Amex/Arca Options, are "unaffected by this issue and continue normal operations at this time," the stock exchange said. However, NASDAQ and the BATS Global Markets stock exchanges have declared "self help" against the NYSE, Buzzfeed's Stacy-Marie Ishmael reported. This means that they are opting out of the national market system due to the NYSE's technical problems. The two exchanges will stop routing trades to and from the NYSE if they have reason to believe the quotes or prices are "stale." Self help is designed to protect investors from having trades executed at bad prices, according to the Wall Street Journal. Losses have been felt across all of the stock markets stemming from the NYSE trading halt, Marketwatch reported. The Wall Street Journal website (wsj.com) was down as well. In the meantime, the newspaper set up a temporary website at http://onlinedr.wsj.com/dr/. Ummm.... http://t.co/YuuuBtJwvv is also down. Earlier today, United Airlines grounded its entire fleet for over three hours due to a computer problem. Department of Homeland Security (DHS) officials said there was "no indication" of a cyber attack behind the problems at the NYSE, United Airlines or the Wall Street Journal's website. The FBI reached out to the NYSE, but was told that "no further law enforcement action is needed at this time," with the NYSEdescribing the situation as a "technical glitch," the FBI said in a statement to CNBC. The bureau will continue monitoring the situation. Securities and Exchange Commission (SEC) Chief Mary Jo White said the agency was "closely monitoring the situation and trading in NYSE-listed stocks." The WSJ site was back online just after 12:00 p.m. ET. The NYSE will close at it's normal 4:00 p.m.